Dr. Ed. Espiner took over Warren’s interest in the premises and continued for some time without change of name. 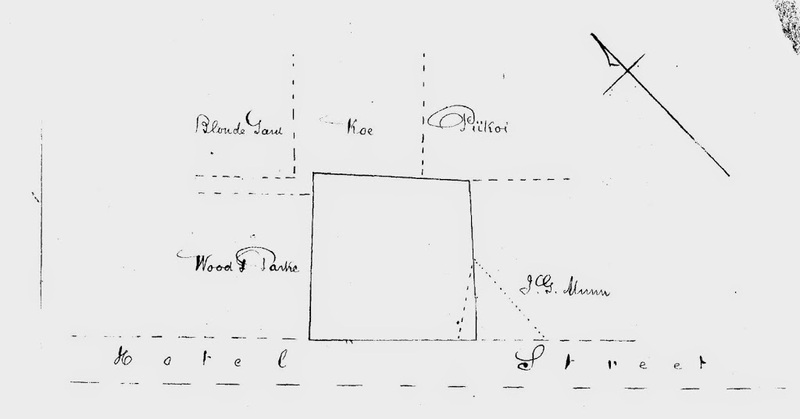 In December, 1840, Espiner sold the property to Wm. French and the ‘Warren Hotel’ name continued until 1844. Samuel Thompson, one of the town’s celebrities, succeeded to it in July, 1849, to maintain it as a first class hotel under the same name. His term was brief, John Bartlett as proprietor of the ‘Canton’ when it was fitted up and became a noted resort for officers of ships in the flush whaling days. 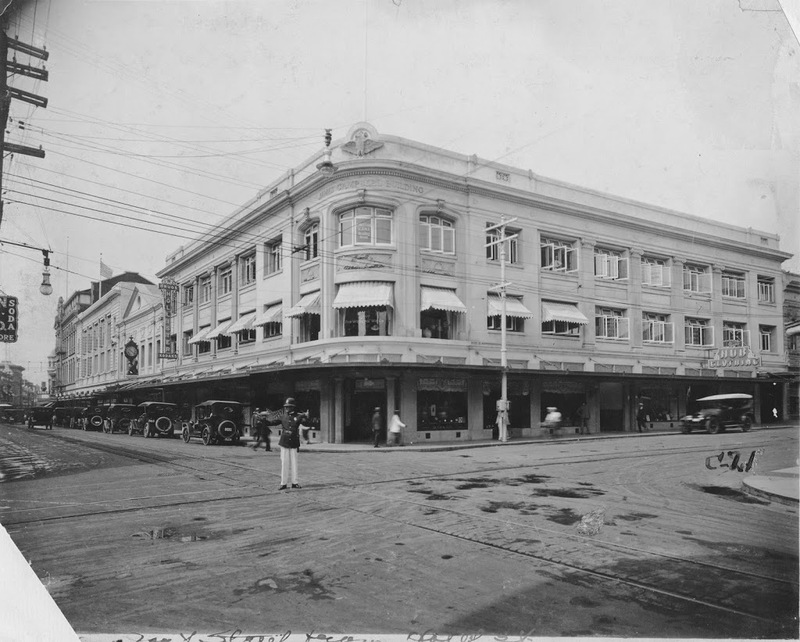 Today, the property ( at the mauka-Diamond Head Corner of Hotel and Bethel Streets) is known as the Marine Finance (built in 1910 – it was known as the National Building when National stores occupied a bunch of it; it’s the home to the Plumbers and Fitters Union and several other shops and offices. The image shows the Land Commission Award map (before Bethel Street extended mauka.) In addition, I have added other images in a folder of like name in the Photos section on my Facebook and Google+ pages. It’s not clear if World War I delayed construction, but the building helped with the war effort. The Hawaiian Gazette on May 14, 1918 noted the Campbell building served as the War Savings and Thrift Stamp committee’s demonstration for its “dig it up in our dug out” campaign. By the next year, merchants in the new Campbell Building were advertising for customers to visit them in the new building. The lower town Campbell Block building started out as Mr. William French’s (the “merchant prince”) Honolulu premises extending from Kaʻahumanu to Fort Street. It was surrounded by a high picket fence with some hau trees standing just within the line of the fence. The property was sold to James Austin, who sold it in 1882 to James Campbell, who owned the adjacent land on the Diamond Head side (fronting Fort Street.) He built the “Campbell Block,” a large building that included uses such as storage, shops and offices. Merchant Street was once the main street of the financial and governmental functions in the city, and was Honolulu’s earliest commercial center. Dating from 1854, the remaining historic buildings along this road help tell the story of the growth and development of Honolulu’s professional and business community. Today, we still see these remnants of the past in lower downtown: Melchers (1854,) the oldest commercial building in Honolulu; Kamehameha V Post Office (1871;) Bishop Bank (1878,) now known as the Harriet Bouslog Building; The Friend Building (1887 and 1900,) the site of the Oʻahu Bethel Church established in 1837; Royal Saloon (1890,) now Murphy’s; TR Foster Building (1891,) forerunner to Hawaiian Airlines; Bishop Estate Building (1896;) Stangenwald Building (1901,) the tallest structure in Hawaiʻi until 1950; Judd Building (1898;) Yokohama Specie Bank (1909) and Honolulu Police Station (1931,) one of the earliest police forces in the world, dating to 1834. Plans called for a combined office and parking structure to replace the 2-story Campbell Block on Fort and Merchants Streets; this new building was considered an important part of the redevelopment of downtown Honolulu. (Adamson) The new building was completed in May 1967. The image shows the James Campbell Building. Given that most visitors and migrants to Honolulu were male, whether they were explorers, sailors, traders, plantation workers, military or tourists, it was only a matter of time before organized prostitution flourished in the areas surrounding their arrival and lodging near the port. The Iwilei brothels (or “boogie houses,” as they were also called back then) were later forced to relocate to Hotel Street and a few adjoining parts of Chinatown. By 1916, the Iwilei Stockade was shut down. At the onset of World War II in 1941, Hawaiʻi had 258,000-civilians and 43,000-soldiers. Six months later, the number of soldiers nearly tripled. In 1944, there were approximately 400,000-military members in Hawai’i. Hotel Street was the center of Honolulu’s red light activities, through which some 30,000 or more soldiers, sailors and war workers passed on any given day during most of World War II. During the war, approximately 250-prostitutes were registered with the Honolulu Police Department. They paid $1 a year for an “entertainers” license. The going rate was $3 for servicemen – sessions lasted 3-minutes. Of the $3 charge, the madam took $1 off the top; the prostitute paid for room, board and laundry from her $2 cut. The majority of official Honolulu prostitutes were white women recruited through San Francisco. Each prostitute arriving from the mainland was met at the ship by a member of the vice squad; she was then fingerprinted and given a license. There were rules to follow; breaking them could result in a beating or removal from the Islands. Few lasted more than 6-months before heading back to the West Coast. While Hotel Street had the reputation as the home of the brothels, most of the houses were in an area bounded by Kukui, Nuʻuanu, Hotel and River streets. During the war years, fifteen brothels operated in this section of Chinatown, their presence signaled by neatly lettered, somewhat circumspect signs (‘The Bronx Rooms,” “The Senator Hotel,” “Rex Rooms”) and by the lines of men that wound down the streets and alleyways. It hasn’t gone away; today, anyone engaged in prostitution – as a prostitute or as a client – faces a petty-misdemeanor charge, and first-time offenders, if not granted a deferred judgment, can be fined not less than $500 but not more than $1,000, or spend up to 30 days in jail, or be sentenced to probation. Subsequent offenses have higher penalties. 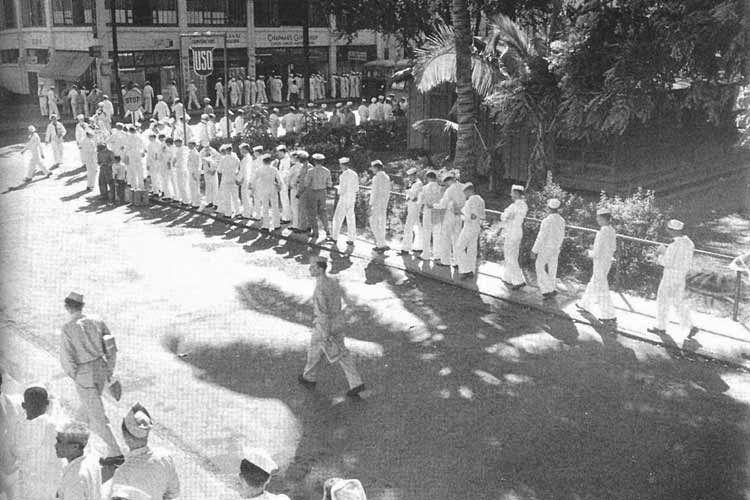 The image shows the line-up of sailors in Chinatown – waiting to spend their $3 for 3-minutes. In addition, I have included other related images in a folder of like name in the Photos section on my Facebook and Google+ pages.